Office of Majority Leader Frank Commisso Sr. The wheel in the logo demonstrates how business, jobs and communities depend on each other to thrive. 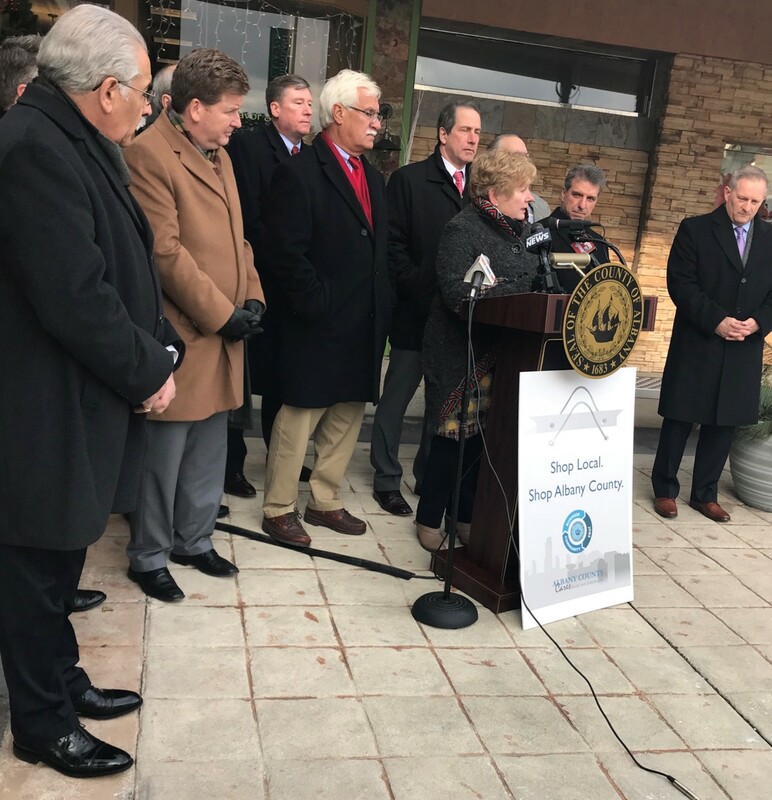 ALBANY (Dec. 11, 2017) — Albany County government and business leaders formed an unprecedented partnership Monday to launch “Shop Albany County,” a campaign promoting the benefits of shopping local and encouraging people to support the great mix of shops and businesses we have throughout the County. 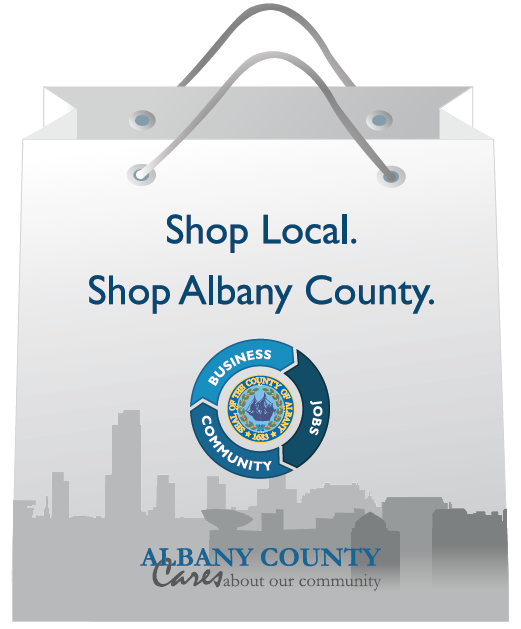 Albany County lawmakers held the media event 14 days before Christmas near Circles, a gift boutique at Stuyvesant Plaza, to unveil a Shop Albany County logo and hand out 6" x 6" window decals and stickers created for the campaign. 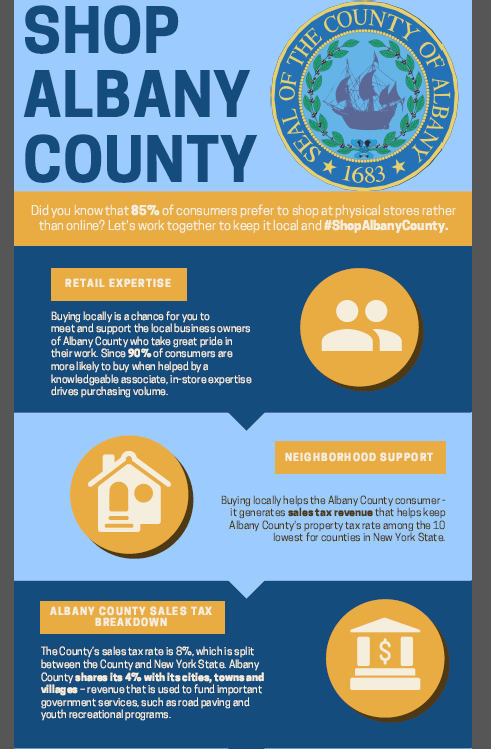 Shopping Albany County this holiday season and beyond will strengthen our brick-and-mortar businesses amid growing competition from internet purchasing and generate sales tax revenue that pays for vital government services, Legislature Chairman Sean E. Ward said. 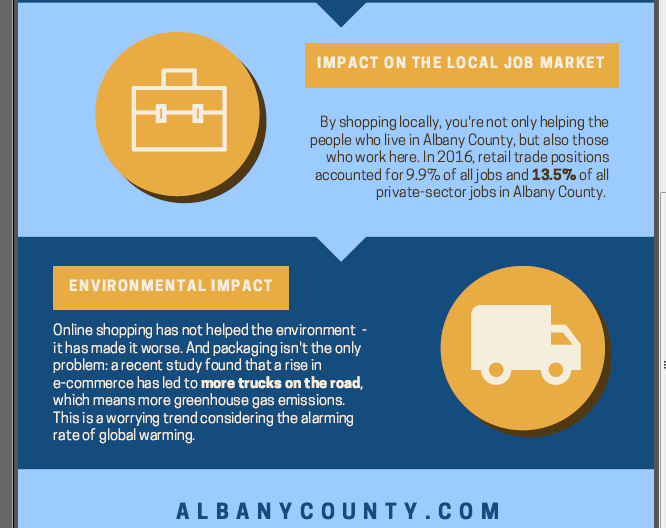 Majority Leader Frank Commisso Sr., the driving force behind the shop local push, said Albany County announced phase one of the campaign during the holiday shopping season to capture people’s attention and raise awareness about an important issue for all communities. Attending the event were a bipartisan group of legislators, including Minority Leader Frank Mauriello, Leg. Dennis Feeney, Leg. Paul Miller, Leg. Joseph O’Brien, Leg. Mark Grimm and Leg. Paul Burgdorf. 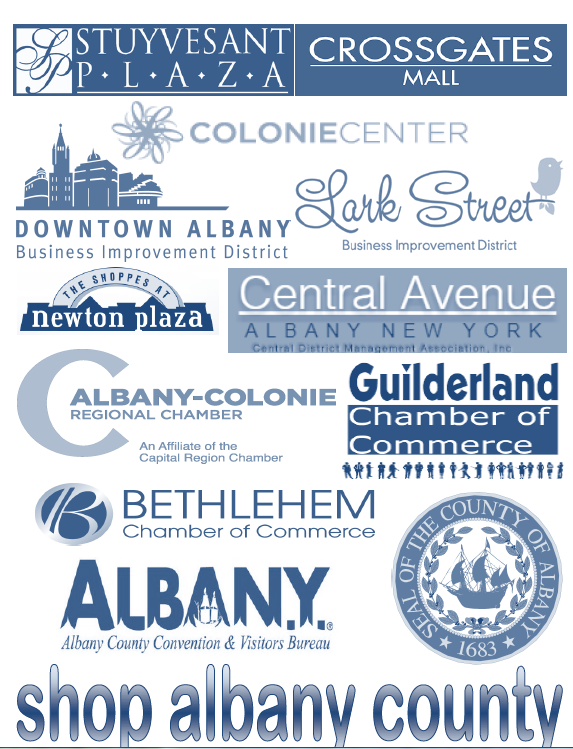 Individuals representing businesses from across Albany County are working with the County to make the campaign a success. Attending Monday’s event were: Mark Eagan, chief executive officer of the Albany-Colonie Regional Chamber, who spoke, Jennifer Simms, manager of member services, at the Albany-Colonie Regional Chamber; Michele Vennard, president and CEO of the Albany County Convention and Visitors Bureau, who is shown speaking in the above photo; Janet Kaplan, vice president, real estate, at Stuyvesant Plaza; Russ Ivory, general manager at Colonie Center; Jennifer Smith, marketing director at Crossgates Mall, who also appeared on behalf of Crossgates Commons; Michelle Viola-Straight, president of the Guilderland Chamber of Commerce; Jennifer Kilcoyne, president of the Bethlehem Chamber of Commerce; Jenny Coye, communications specialist at the Downtown Albany BID, who videotaped the event and streamed it live on Facebook (see below), Jason Bonafide, special events manager for the Downtown Albany BID; Anthony Capece, executive director at the Central District Management Association; and Shauna Collins, executive director at the Lark Street (BID) Business Improvement District. If your store, business or organization would like to join this effort, or simply request a window decal or Shop Albany County stickers, please contact us at (518) 447–5527. 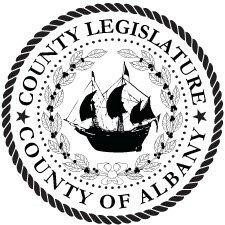 Led by its Democratic Majority, the Legislature establishes laws and government policy for #Albany County, New York.